Why did the Baroque Style develop? Figure 1. An example of quadratura from Ca' Rezzonico in Venice. The Baroque style is seen as a generally lively or even ostentatious artistic, architectural, and musical style from the late 17th to the late 18th century. This vivid style is prominent in regions in what are today Italy, France, Spain, Portugal, Germany, and Austria, where it represents a movement that became particularly popular among Catholic regions or countries in the wake of the Protestant Reformation. This vividness contrasts greatly from the plain and often dull styles of Protestant Europe, although eventually Baroque styles even influenced these regions. The context of Baroque development has to be seen in light of the great religious conflicts of the 16-17th centuries, such as the initial conflict between Luther and the Catholic Church and eventually the Thirty Years War that tore much of Europe apart. During the Council of Trent, in 1545–63, the Catholic Church was looking for a new style that would contrast itself from Protestantism and also give it a style that people could embrace. Initially, this was in the form of austere buildings that had few fans. Soon, however, the movement that became the Baroque began with new developments in architecture in Italy, which in the early 17th century embraced color, vivid display, and pageantry. This is manifested in the cupolas that constituted the large church domes and quadratura ceiling paintings. Church interiors became highly decorated and more decorative elements were added to the altar and columns of the great hall within the church. Emphasis was to put the parishioners close to the altar to make them experience the grandeur of the church and ceremony. Twisting columns had begun to develop that allowed also light reflection that gives a sense of motion (Figure 1). These styles soon found themselves in palaces and secular architecture as well. In the early 17th century, Baroque now began to spread to statuary art, or at least influences in thought began to affect statuary composition. This included work by Gian Lorenzo Bernini, who became perhaps the most influential artist to affect statuary expression of the Baroque style. Statues began to become more lively and expressive rather than stern. Bernini would later influence Giuseppe Pannin, who would go on to make the largest Baroque-style fountain in Rome, the Trevi Fountain. Music in the late 1580s already began to turn away from the Renaissance music style as composers such as Jacopo Peri began to develop not only Baroque style but also what would become opera. Dafne was composed by him in 1597 and is often considered as the first true opera. The Medici court had patronized him and he was also influenced by Jacopo Corsi. New musical innovations or heavy use of older ideas began to be associated with the Baroque style, including more harmony and use of tonality that would sometimes improvise on the chords. 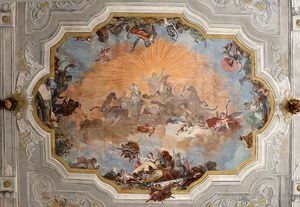 The mid-17th-18th century began to become called the High Baroque, where experimentation with new ostentatious styles in architecture formed as well as in art. Paintings now took on more vivid appearances, where the depiction of motion was critical to the setting. Contrasts and warm colors were used in paintings to give them more life, including using more white to add brightness. The integration of vivid art scenes with Baroque architecture became in great vogue, where artists such as Pietro da Cortona began to integrate lively figures within architecture in churches. Figure 2. A view of the Palace of Versailles from one of the main gardens. Although one can say already some churches in Italy, particularly Rome, in the 1580s began to display a new Baroque style, most of the Baroque in the late 16th century was confined to Italy. It only really began to spread in the early 1600s, when Spain began to create its own Baroque churches, such as the San Isidro Chapel in Madrid. The Baroque style soon began to change and adapt to local styles as it spread further still. The 17th century, with its heightened tensions between increasingly separated factions of Europe due to religious conflict, increasingly this period saw art and architecture as expressions of that separation, with the Baroque being a key example. In France, the Classical style was a form of Baroque popularised by Louis XIV and XV, where architecture was far more geometric and maintaining simpler forms where symmetry was the focus. 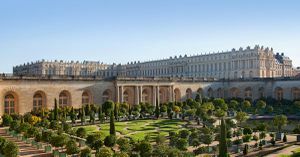 The Palace of Versailles built in the 1680s exemplifies the Baroque style used in French architecture. On the one hand, the palace was extremely large and ornate, but the external elements were generally less ornate and more conformed to more geometric proportions (Figure 2). In France, the baroque style gave way to the Rococo, which was a style that contained asymmetry, curvy depictions with heavier use of white and pastel colors in paintings. This was during the mid to late 18th century; however, most scholars consider this style as an off-shoot and influenced by the Baroque style. By the late 18th century, there was renewed interest in more traditional Classical themes in art and architecture. The Paladin style, which was already popular in Britain where the Baroque style never became popular for British tastes, emphasized proportional, free-standing buildings that were geometrically uniform and less ornate. This style became more popular in Europe in the 19th century, as more ostentatious views on architecture and art became less popular. In Britain, there was an eventual renewed interest in the past in the mid 19th century, leading to a revived Gothic style or interest that characterized well known Victorian buildings and architectural styles. The baroque style started as a reaction or even part of the wider counter-reformation movement against Protestant Europe. The use of baroque was a way for Catholic parts of Europe to easily distinguish themselves. It soon developed a number of sub-styles and local variations of baroque developed in the countries where it was adopted. From the 17th and most of the 18th centuries, baroque dominated the arts, including architecture, sculpture, including music with famous composers such as Bach being a product of this era. 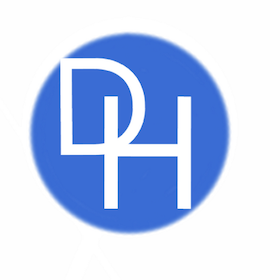 ↑ For more on the initial and what would become the key elements of the Baroque style of architecture and art, see: Millon, Henry A., Musée des beaux-arts de Montréal, National Gallery of Art, Musée des Beaux-Arts, and Fiat SpA, eds. 1999. The Triumph of the Baroque: Architecture in Europe 1600-1750. London: Thames & Hudson. ↑ For more on art, sculptures, and music in the Baroque period, see: Sitwell, Sacheverell. 2006. Southern Baroque Art: Painting, Architecture and Music in Italy and Spain of the 17th & 18th Centuries. Home Farm Books. ↑ For more on the spread and influences of Baroque style on different regions, see: Minor, V.H. 2004. Baroque & Rococo: Art & Culture. Princeton, N.J.: Recording for the Blind & Dyslexic. ↑ For more on the Baroque and its influences, including in Protestant regions, see: Maravall, José Antonio. 1986. Culture of the Baroque: Analysis of a Historical Structure. Theory and History of Literature, v. 25. Minneapolis: University of Minnesota Press. ↑ For more on the post-Baroque period and styles, see: Kaufmann, Emil. 2013. Architecture in the Age of Reason: Baroque and Postbaroque in England, Italy, and France. Cambridge: Harvard University Press.